Tag line: "You were right to be afraid of the dark"
Like many kids, I was once afraid of the dark, and to alleviate my fears plenty of well-meaning adults would tell me that there was nothing in the dark that wasn’t also there during the day. 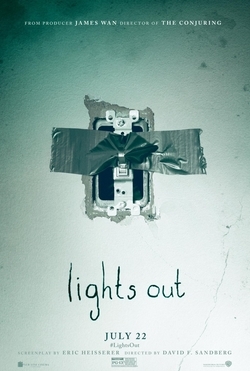 I always knew that was BS, and Lights Out, a 2016 horror movie produced by James Wan, proves I was right. It’s been some time since the tragic death of his father (Billy Burke), yet the family turmoil continues for young Martin (Gabriel Bateman), who hears his mother Sophie (Maria Bello) talking to herself for hours on end in the middle of the night. But upon investigation, Martin realizes his mom is not alone after all: a shadowy creature, which can only be seen when the lights are out, is with her. Sophie insists this entity is her friend, and refers to it as “Diana”, but Martin is so petrified that he can’t even sleep at night. After falling asleep (once again) in class, Martin asks the school to call his older half-sister Rebecca (Teresa Palmer) to come pick him up. Though her relationship with their mother is strained (she left home years earlier, and has been living on her own for some time), Rebecca agrees to let Martin stay at her apartment. But to her dismay, “Diana” turns up as well, reminding her of a childhood encounter she herself had with the entity. In an effort to help her kid brother, Rebecca does a little research and uncovers some startling information regarding both her mother and Diana. Aided by her boyfriend Bret (Alexander DiPersia), Rebecca spends the evening at Sophie’s house in the hopes of ending this nightmare once and for all. But Diana isn’t about to go quietly into the night. Directed by David F. Sandberg, Lights Out is a very unique ghost story in that it gives us a malevolent spirit that can only be seen in the dark (it disappears completely when a light is turned on). As you can imagine, this leads to a good number of jump scares, and it’s to the filmmakers’ credit that, even when we know one is coming, these “surprises” are still damned unnerving. Lights Out also benefits from having one of the creepiest ghosts I’ve seen in some time; a tall, lanky being with no discernible features, Diana slinks in the shadows and hides in dark corners, waiting to pounce on those she views as a threat (which is pretty much anyone who might come between her and Sophie). Even when we learn a little about Diana (including why she stays out of the light, and the reason she and Sophie share such a strong bond), it doesn’t reduce the film’s scare factor one iota. If anything, her backstory is so disturbing that it actually makes Diana even more frightening than she was before! In addition to its horror elements, Lights Out is also an effective family drama (along with looking out for each other, Rebecca and Martin try their darnedest to help Sophie) with a dash of romance thrown in for good measure (as the terror escalates the relationship between Rebecca and Bret grows stronger). So, for anyone who is still afraid of the dark, don’t be ashamed to sleep with the lights on. After watching Lights Out, it may be the only way you’ll be able to get a little shut-eye!